Originally constructed in 1905 by renowned architect Cass Gilbert, the Beaux-Arts inspired Minnesota State Capitol had reached a critical deterioration point. By 2010, with crumbling exterior marble and stone, antiquated systems, inefficient public areas, and poorly conserved paint and murals, it became clear this century old masterpiece needed a comprehensive restoration. After studying and assessing these areas of improvement, our team identified three primary objectives for the project: improve functionality; enhance security systems and infrastructure; and preserve and restore the architectural integrity of this historic landmark. Over time, the Capitol’s white Georgia marble exterior had deteriorated due to water and environmental damage. We replaced stones where necessary, and created a database of each piece of marble for better maintenance in the future. The Capitol also received a new roof and windows, and the main avenue in front of the Capitol building was converted to a public pedestrian promenade. 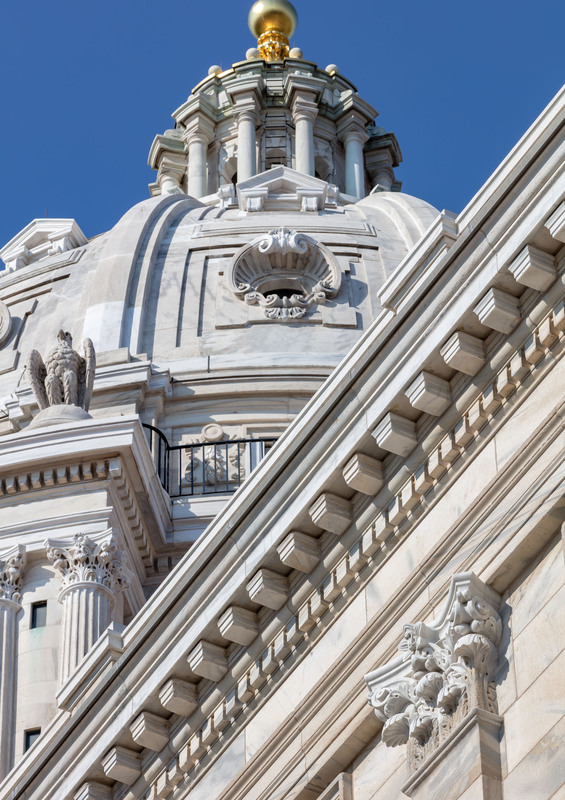 Inside the Capitol and in collaboration with multiple contractors and subcontractors, we installed entirely new, energy-efficient, cost-effective, and low-maintenance mechanical systems. Our primary challenge was finding ways to insert the new systems into ceilings and walls decorated with historically significant murals and decorative paintwork. Using BIM modeling and laser scanning, we carefully coordinated and inserted ductwork, wiring, and plumbing into the walls and ceilings. In the office areas, carpet was removed, revealing the Capitol’s original mosaic tile floors and the skylights were restored. In conjunction with the Minnesota Historical Society, original paint and murals in the rotunda that had been damaged by water were painstakingly preserved. Additionally, because the Capitol was the first building in the state to have electrical lighting, our team saved as many historic fixtures as possible, which were rewired, refurbished and retrofitted to accommodate LED bulbs. Today, the Minnesota State Capitol enjoys all the conveniences of a modern, state-of-the-art government building. The project balanced innovative solutions and high impact interventions with technical restoration, while seamlessly integrating modern systems into the historic fabric. The highest compliment anyone could pay the design and construction team is, ‘What did you really do? The complexity of effort that went into what you don’t see was astounding—effort that made the building safer, more secure and more accessible, while preserving the building’s historic characteristics and ensuring it looks just as it did in 1905. That’s the real story. An extensive scaffolding system weighing 250,000 pounds was erected inside the rotunda. Long-lasting LEDs are used in 99 percent of the light fixtures. Over 30,000 pieces of stone makeup the Capitol facade, a vast majority of which received some level of treatment.